Goya Foods in collaboration with First Lady Michelle Obama’s Let’s Move initiative and the USDA, launches the second edition of the MyPlate/ MiPlato cookbook, Happy, Healthy Celebrations: Bright, Bold, Healthy Latin Recipes to Celebrate Every Occasion! 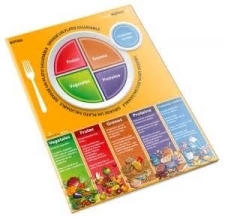 This book is part of the national MyPlate campaign designed to help educate Americans on eating healthy. [A pdf copy of the cookbook is available for free at www.goya.com.] Happy, Healthy Celebrations: Bright, Bold, Healthy Latin Recipes to Celebrate Every Occasion! is a free bilingual cookbook featuring 10 complete plates with 30 healthy recipes that celebrate the culinary traditions of the Latin culture from around the world. Each of the recipes incorporates all of the five basic food groups for a balanced diet including fruit, vegetable, grain, protein and dairy. The cookbook also includes nutritional information for every recipe, easy-to-follow cooking tips, and estimated costs for every affordable meal. “We’ve always produced healthy products such as our Goya beans, rice, frozen vegetables and other household staples like olive oil and seasonings; all naturally good for you,” says Joe Perez, Senior Vice President of Goya Foods. “The MyPlate campaign has been a successful collaboration with the First Lady and has given us the opportunity to expand our product portfolio as well as provide the necessary tools and education to meet the health needs of our consumers.” For more information about Goya and a free pdf copy of the cookbook, please visit Goya.com. For special giveaways, please visit @GoyaFoods on Facebook, Instagram, Twitter and Pinterest.